AMG models have a reputation for being brutish, tyre shredding hooligans, no matter the bodyshape. Mercedes-Benz recently invited us on to test the Mercedes-Benz CLS 63 AMG at its Mercedes-Benz World facility near Brooklands, Surrey. Would it live up to the reputation? This is our first impression. The CLS-Class is now in its second generation. The first generation became an instant classic, forging a new market for stylish luxury sedans such as the BMW 6-Series Gran Coupe, the Audi A7 Sportback and, to a lesser extent, the Volksswagen Passat CC. The second generation follows on from this, retaining the low slung Coupe look. The second generation gets wider arches, giving it a powerful look. Underneath the sleek aluminium bodywork sits a 5.5 litre, twin-turbocharged V8 engine. In our test car, power was pegged at 525hp, however, the AMG Performance Pack allows customers a full 557hp. Torque is a similarly impressive 700Nm delivered between 1,700rpm and 5,000rpm. Mercedes-Benz AMG claims the engine is assembled by a single engineer from start to finish. Power is transferred to the rear wheels through an AMG Speedshift MCT seven-speed gearbox. Despite being a mouthful, the gearbox is one of the highlights. It is a wet clutch unit with power available across the range and a smooth shift. The CLS 63 AMG has launch control and we can report that it does its job extremely well! The chassis is based upon the E-Class which means, for the large part, it is constructed from aluminium. 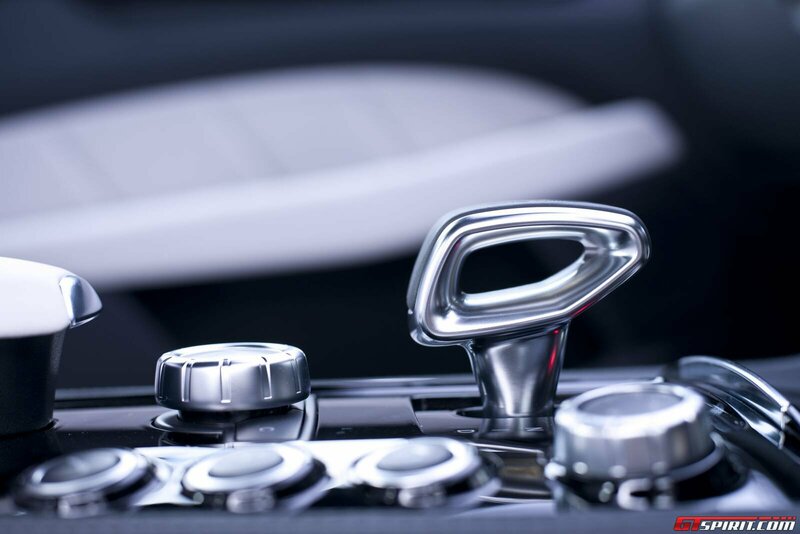 In the CLS, the doors are frameless and constructed from aluminium. This combination helps reduce weight and also gives aesthetic advantages. Despite this, the CLS 63 AMG still feels very heavy. Hustling it from corner to corner, the weight transfers have to be judged well. Once you understand the poise and balance of the weight though, the overall feel is very rewarding. The suspension is a multi-link setup at the front and rear. Selective damping is included in the lower value CLS models. For the Mercedes-Benz CLS 63 AMG, an AMG-specific version of the AirMATIC setup is fitted as standard. 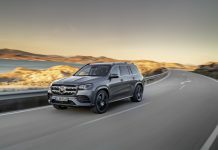 This is referred to as AMG Ride Control and is essentially an air suspension system with adaptive damping and the ability to self-level. AMG Ride Control for the CLS 63 AMG includes new steel spring struts for the front axle. The front is 24 mm wider that the standard setup with the rear also gaining a unique, AMG constructed air spring. The idea here is that the rear levels out the car whilst the front remains responsive. It gives a proper rear-driven setup with the amount of power dictating the exact movements of the car. The chassis also features a new tubular anti-roll bar, new control arms, new wheel bearings and more negative camber than any other CLS in the range. Over the previous generation Mercedes-Benz CLS 63 AMG, the car we reviewed benefits from a 50 per cent drop in body roll. From behind the wheel, you’ll only really be concerned about the electronically-controlled damping system though. 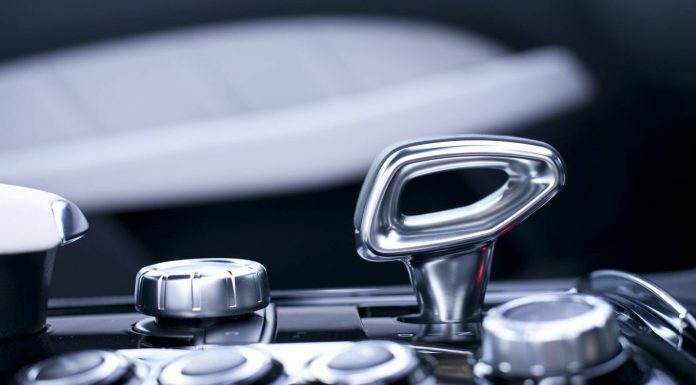 In the Mercedes-Benz CLS 63 AMG, three chassis settings are available through dash-mounted buttons. Comfort retains a maximum setting for the traction control and stability systems with a softer damper setting. Sport looses these electronic settings a little more with 40% stiffer dampers. In Sport you’ll get a small amount of slip before the traction control sets in. Sport Plus removes all but the most essential safety features and adds a unique algorithym calculated through sensors to produce optimal damper performance. Its Sport Plus mode that fully reveals the CLS 63 AMG’s true characteristics. 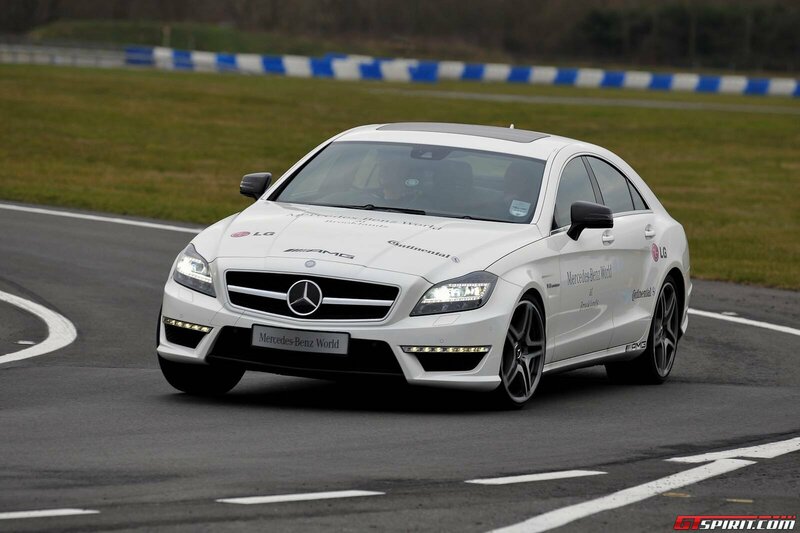 A few laps into Mercedes-Benz World’s short circuit, we start to understand what the CLS 63 AMG is all about. Something that becomes clear is the need to be progressive with the throttle on the exit from corners. A long right-hander reveals that with heavy acceleration out of corners the rear will slip a little, even in dry conditions. In Sport mode, the traction control gathers everything up nicely. Soon, we’re connecting the corners together nicely. 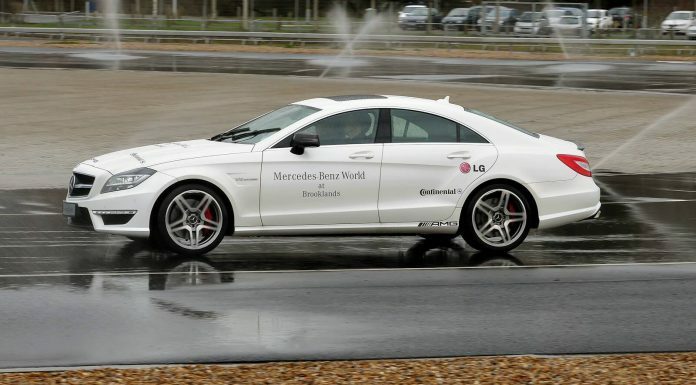 Aside from the track, another advantage to testing at Mercedes-Benz World (one of three) is that we get to test the cars drifting capabilities on the wet skid pan. A blip of the throttle and we have the car sideways. This is a completely different experience to that of the track. A precise control of the throttle is key to controlling the rear wheel slip and the sideways angle. The CLS 63 AMG throttle response is instantaneous, which makes for a difficult time and plenty of spinouts. 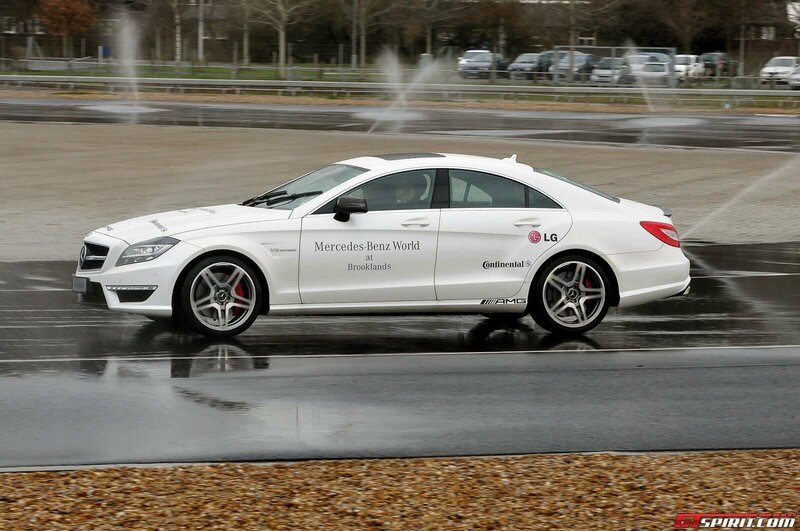 The third advantage to Mercedes-Benz World is a set of brake test areas. These demonstrate the latest in Mercedes-Benz braking technology. The Mercedes-Benz CLS 63 AMG uses 360mm internally ventilated and perforated brake discs with 36mm depth at the front and 26mm depth at the rear. Callipers are six piston at the front and four piston at the rear. Electronic systems include ESP, ABS anti-lock system and AMG-tuned Acceleration Skid Control (ASR). We tested all these functions to the maximum. Whilst emergency braking in a straight line with our hands removed from the steering wheel, the electronic systems manage to guide the car to a complete stop whilst guiding the car straight down the centre of the lane. Braking whilst changing direction isn’t a problem either. The electronic systems allow you to navigate around obstacles whilst performing an emergency stop. Its at this point that we should also point out that our CLS 63 AMG also came fitted with a stop start system. Overall, we have a huge amount of fun with the Mercedes-Benz CLS 63 AMG. As we have pointed out, despite the use of aluminum and other lightweight composite materials, the CLS 63 AMG remains a heavy car. Yet the mix of powerful engine, electronic wizardry and sheer presence gives it an endearing quality. 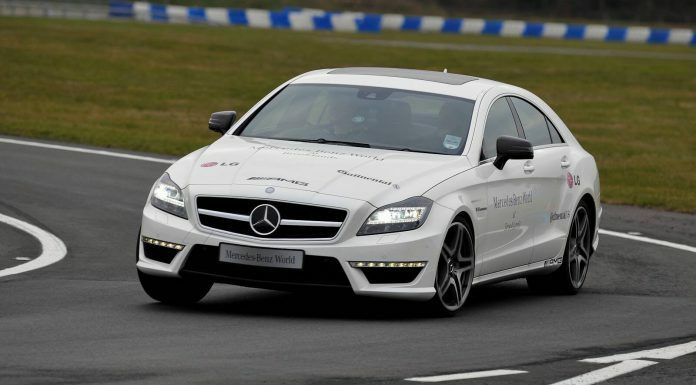 Whilst we haven’t yet had the opportunity to test the CLS 63 AMG on the road, we absolutely loved it on track. Please, Mercedes-Benz, could we borrow another for an extensive test?